Quinoa (pronounced keen-wah), once a sacred food of the Incas, is a seed not a grain, and when cooked has a texture similar to couscous. Serve as an accompaniment to the main course. Add the quinoa to a large pan containing 1 litre of boiling water and simmer over a moderate heat for 10 minutes or until the seeds become swollen. Remove from the heat, cover with a lid and set aside until any excess liquid has been absorbed. Stir with a fork to separate the seeds. Peel and deseed the papaya, and cut into 1cm pieces. Roughly chop 1 pack of mint. Deseed and slice the chillies. Mix these ingredients into the quinoa, reserving some of the chilli to garnish. In a small bowl, mix the juice from the lime with the olive oil and season to taste. Pour over the quinoa and mix well before serving. Garnish with the reserved chilli and the remaining whole mint leaves. Cook's Tips Prepare to the end of paragraph 2 of the instructions before transporting to the party. Eat the quinoa when it's at room temperature or reheat in a large saucepan, wok or microwave. Add the dressing after reheating. Prepare to the end of paragraph 2 of the instructions before transporting to the party. 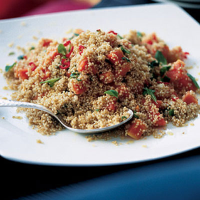 Eat the quinoa when it's at room temperature or reheat in a large saucepan, wok or microwave. Add the dressing after reheating.